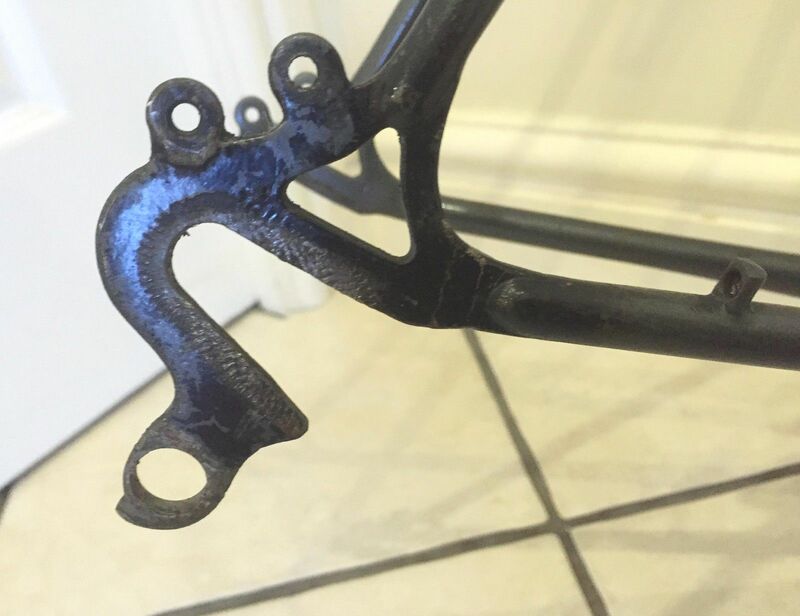 There is a clear indication given by the rare period Reynolds respray transfer that this little frame has been refinished. The fork blade transfer suggests this as being built post 1982 which is clearly incorrect. There is an issue with post 1970 numbering and that is ongoing work. It is a constant dilemma for us. If the frame was built in 1978 it was not very likely to be refinished until well after 1982. 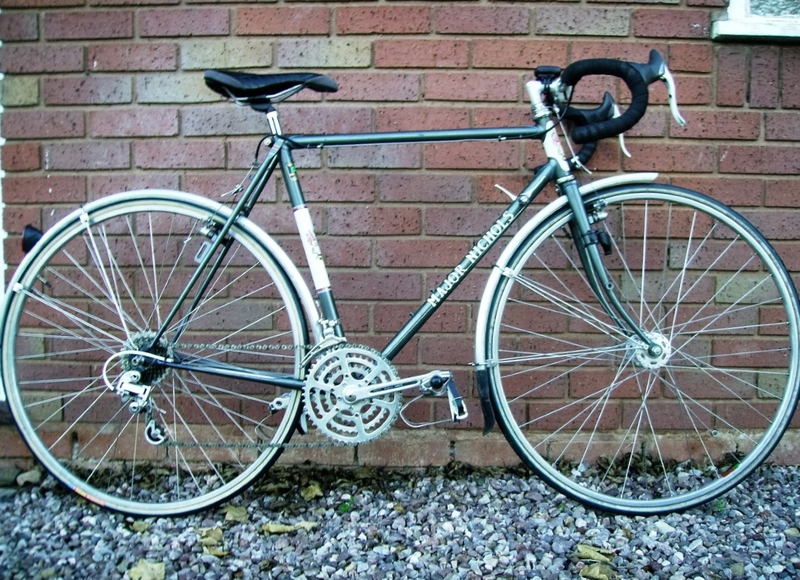 It was fitted with Shimano 600 Cantilever brakes that were made from 1982 to 1984. The frame has a 128mm OLN which suggests it could be later than 1972. The choice of fork crown is normally post 72. The frame number is numerically close to 7248 the gold Record Road Sprint which is definitely early 70’s. 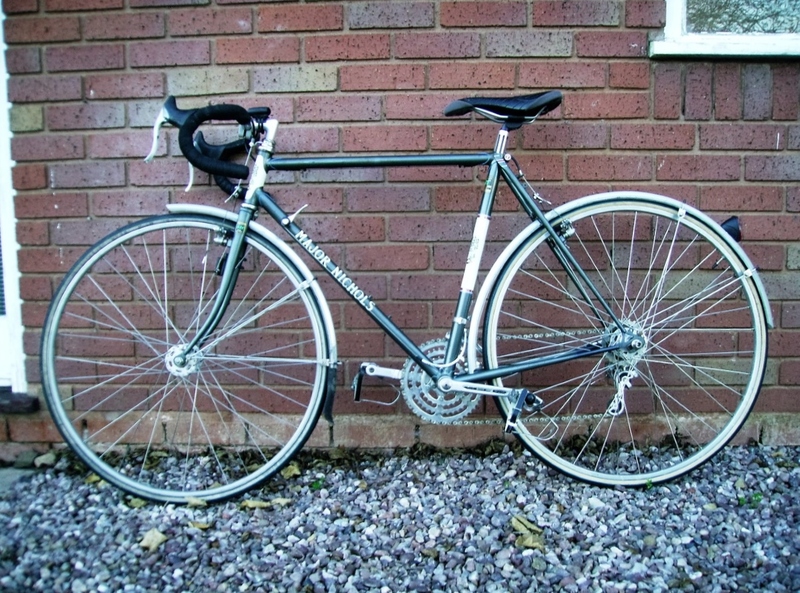 It is designed and built as a Tourer with cantilever brakes, carrier bosses and and drillings. 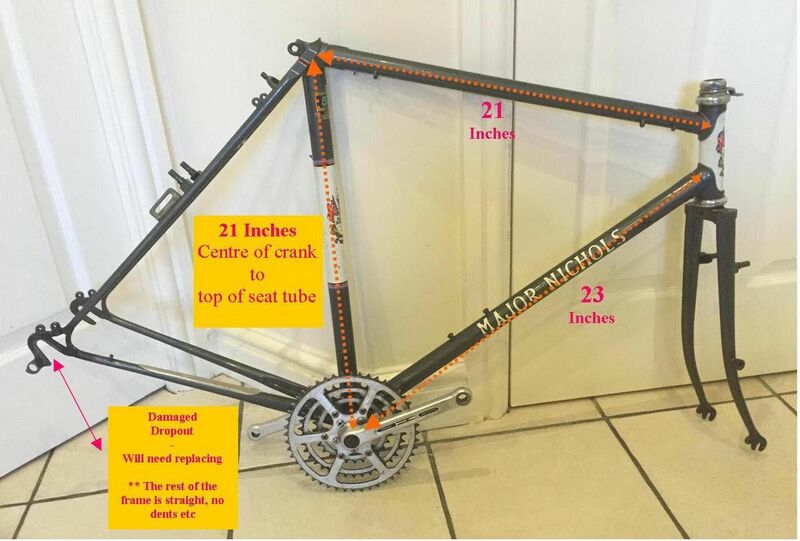 As a result I have revised my initial view that this frame was more probably built in 1978 and is earlier at 1972 and then refinished in the period 1982 to 1985 and refitted at the same time. The Tange Levin headset sets the useable stack height of alternative headsets. This grey was one of Major’s favourites. 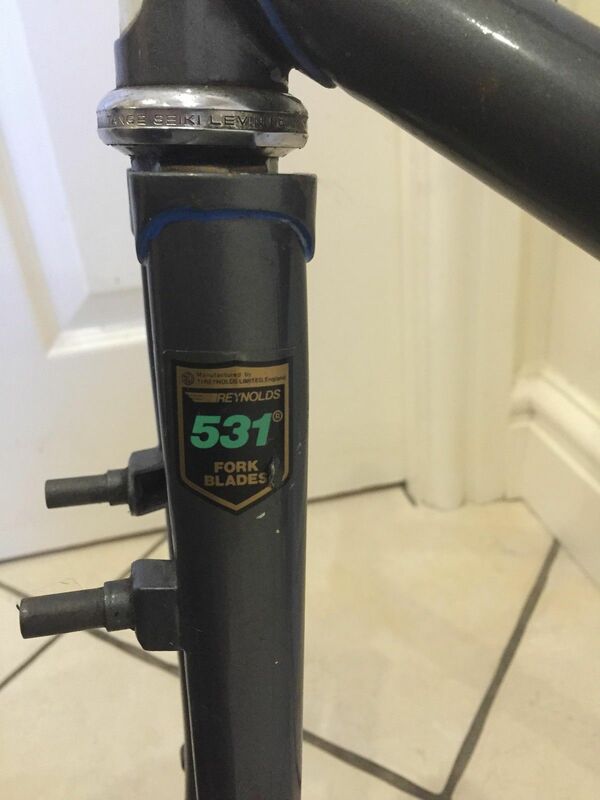 There is a rare Reynolds respray decal on the S/T top and also the Reynolds fork blade decals (post 1982). The seat tube internal diameter at 27.2mm says Reynolds 531 DB tubing to me and the frame is built with Prugnat short spearpoint lugs with heart shaped cut- outs. The seatstay bridge is straight and reinforced. The chainstay bridge is also straight and there is a tough rear brake bridge. The seatstay topeyes are nicely faired in. The fork crown is a Cinelli style flat topped example with losanges fraise’ tops, probably by Vagner. This crown is a feature of the RRS model of the 90’s. The forks are a nice sickle shape. Cantilever brake bosses, lamp bracket on rear off side seat stay. Lamp boss on the offside fork blade. DT bottle bosses. Unusually no pump pegs. Cable guides for rear derailleur with a cable stop on the offside chainstay. Cable guides and bosses for front and rear derailleurs. Rear brake cable guides and stops under the top tube. Rear carrier eyes are on rear seatstays and rear dropouts. 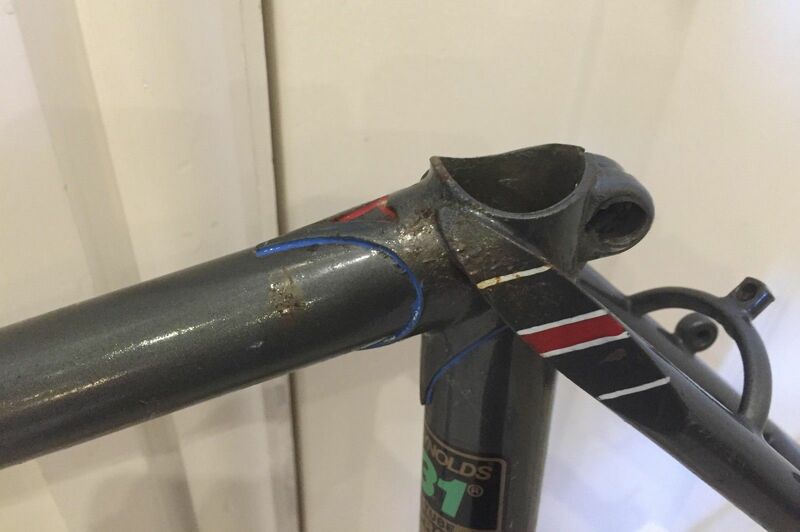 Mudguard eyes are on dropouts. The front are Campagnolo and the rear are Zeus Competition, one of which has been sorted out by Trevor Jarvis, bless him! A metallic silver-grey, ivory white seat and head panels with the Durban Road transfers. 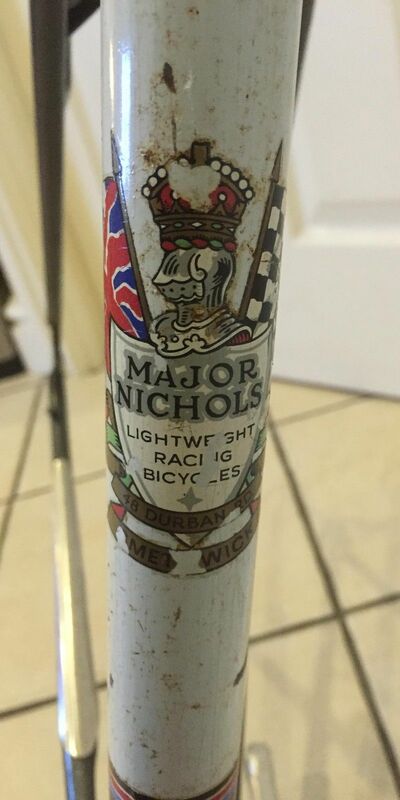 Major Nichols gothic script, white black edged name transfers on the downtube and dark blue, red and gold lug lining. The faired in top-eye faces are decorated with white more or less horizontal slashes and a red central infill panel. This style pops up throughout Major’s career. It appears on faired in and early wrapover seatstays. They are a nice feature to have. 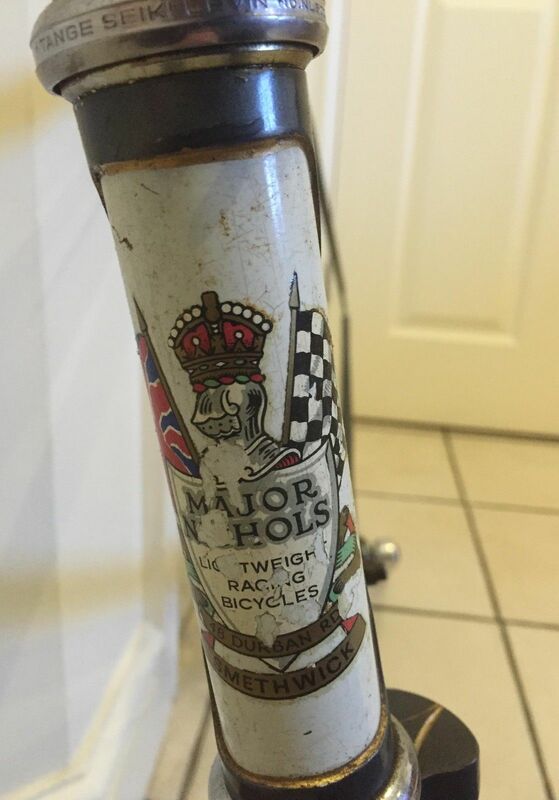 The down tube transfers have now been touched up and still match the patina of 30 years and given a clearcoat to give a bit of extra protection. 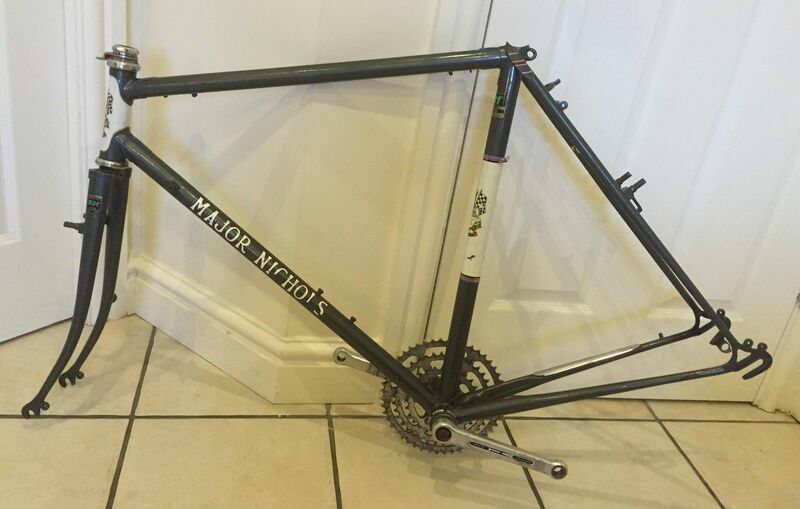 Rebuilt with the 1980’s refit in mind include the existing TA triple chainset and Mavic pedals, wheels, indexed Shimano 600 levers , Suntour V-GT luxe rear and a front Cyclone Derailleur. Shimano 105 aero brake levers serve the refitted Shimano 600 canti brakes. 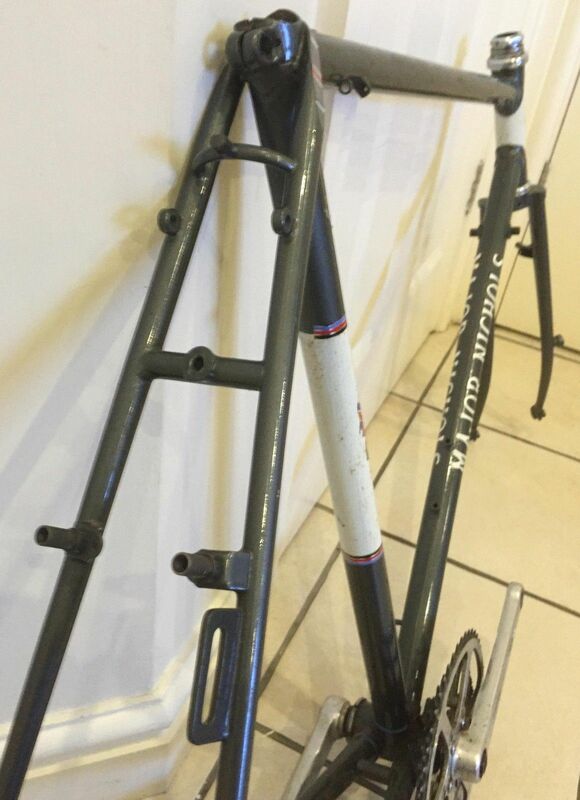 A pair of 80’s mudguards for winter. Needs a rack perhaps.